Sean Lynch stretches for the ball. The sophomore midfielder scored a goal in the Wildcats’ 2-1 loss at Penn State on Sunday. Northwestern has struggled to capitalize on late-game opportunities throughout the 2017 campaign. Out of its 91 second-half shot attempts this season, only seven have resulted in goals. On Sunday afternoon, the Wildcats fell short again. NU (6-11, 1-7 Big Ten) failed to convert on four shot attempts in the last nine minutes of the game and suffered a 2-1 loss to Penn State (5-9-2, 2-6 Big Ten) on a rain-soaked day in State College. With the loss, the Cats will settle for the No. 8 seed entering next week’s Big Ten Tournament. NU now faces a much more difficult postseason road. It will play a first round play-in game against ninth-seeded Rutgers next Saturday before the rest of the Big Ten teams face off Sunday. Four different Cats players registered shots in the last nine minutes of the game in attempts to find an equalizer to send the game into overtime. The best opportunity came on a header attempt from sophomore midfielder Mattias Tomasino in the 82nd minute that hit the crossbar. The Cats’ lone score of the day came on a header from Lynch in the 35th minute. Lynch’s goal, his third of the season, was a lone bright spot on a quiet day for an offense that recorded only 12 total shots. The Nittany Lions controlled possession for the majority of the first half, scoring first in the 18th minute. NU dedicated its energy to containing on defense rather than attacking forward, managing only four shots in the first half compared to Penn State’s 12. The tables turned in the opening minutes after the break, as the Cats earned three early corner kicks and three shots in the first nine minutes of the period. The shift in possession didn’t last long, though, and Penn State came fighting back midway through the period. Forward Aymar Sigue scored off a rebound in the 67th minute to give the Nittany Lions the lead. The team’s focus now shifts to the postseason, Lynch said. 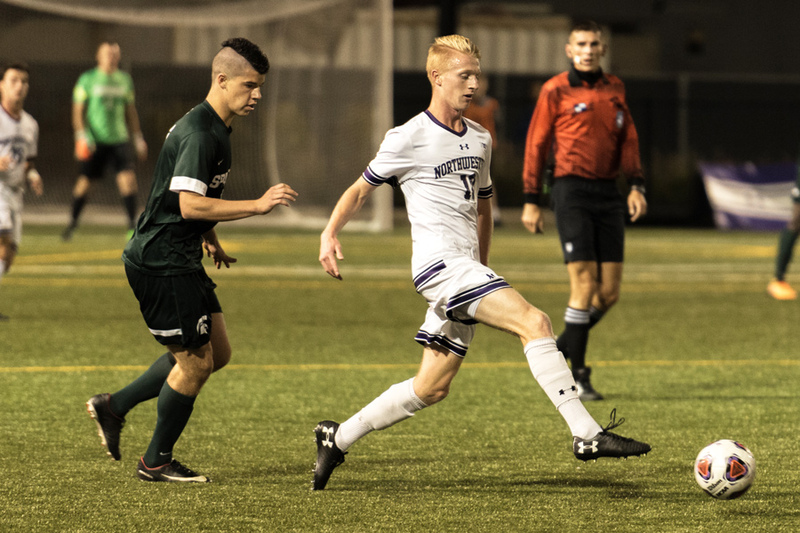 He added that it will be key for NU to stay concentrated on Saturday’s match instead of thinking ahead about a possible quarterfinal meeting with top-seeded Michigan on Sunday.